An aerial image of Australia Pacific LNG. A PROMINENT industry chief is singing the praises of Queensland's resource sector after a new report showed the value of exports had not dwindled despite a drop in shipments late last year. 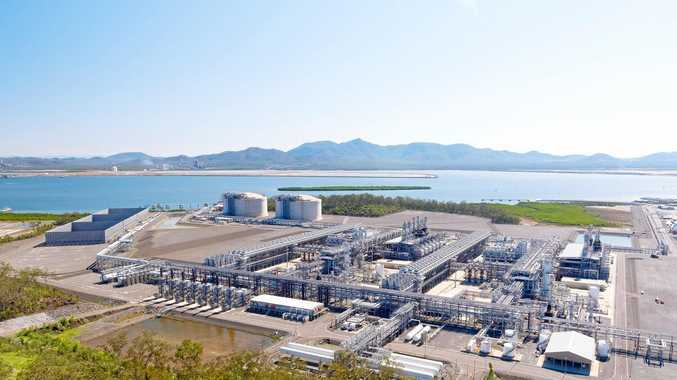 The December quarterly figures from Queensland Treasury showed exports from resources were "powering ahead", according to Queensland Resources Council chief executive Ian MacFarlane. The report showed the value of thermal coal exports increased 18 per cent, while the worth of LNG exports lifted 15 per cent. Respected gas industry analyst EnergyQuest said high LNG spot cargo prices in Japan helped bump up the value of the commodity from Australia late last year. The high prices continued in January, when prices for LNG spot cargoes rose to their highest in almost three years. Curtis Island LNG exporters reaped the rewards of the booming price, shipping 128,508 tonnes of LNG to Japan in January. "Japanese imports of LNG hit their highest in at least five years in January, with shipments expected to continue to be high due to continued freezing weather," chief executive Graeme Bethune said. In the March report, released last week, Mr Bethune said LNG export revenue was "accelerating". Revenue for 2017 was $25,652million, up 43.2 per cent from 2016. It anticipates 65million tonnes of LNG exports this year. Mr MacFarlane the report also found thermal coal and LNG increased in value 34 per cent and 36 per cent in value over the 12 months. "Demand for these commodities is expanding from both developing economies in Asia and established economies," he said. "A good sign the global economy is healthy is reflected in copper demand and the base metal outshone all other commodities over the three months, achieving 60 percent growth. The copper story in Queensland looks good with the Australian Bureau of Statistics recording a 41 per cent jump in exploration funding last week. "Coking coal was still feeling the effects of Cyclone Debbie, down for the quarter, but still achieved a 23 per cent increase in value over the year."